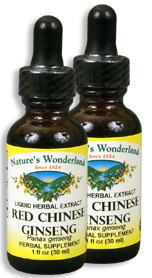 Chinese Ginseng Extract, Red, 1 fl oz / 30 ml each (Nature's Wonderland) - Penn Herb Co. Ltd.
Ginseng is the ideal tonic for the 21st century fast-paced lifestyle. Its beneficial compounds support energy, stamina and mental performance, especially during high stress situations. Our premium Red Ginseng Root is the choice for those who need an extra energizing lift. Our quick-absorbing liquid extract goes to work right away for an invigorating, caffeine-free energy boost. NOTE: Red or white Ginseng reflects the difference in traditional preparation methods. White Ginseng is unsteamed, retaining its natural color and is the better choice for those needing a gentle energy boost. Red Ginseng is steam processed, resulting in a warmer, potent, stimulating root. AMOUNT PER SERVING (333mg/ml or 30 drops): Selectively Imported Red Chinese Ginseng Root (Panax ginseng). OTHER INGREDIENTS: Grain Alcohol (40-50% by volume), Deionized Water. Free of: milk, dairy, egg, fish, shellfish, tree nuts, peanuts, wheat, gluten or soy. Caffeine-free alternative for boosting energy; alleviates fatigue, physical & mental exhaustion; restores sexual energy; improves memory & concentration; supports hormone balance; enhances athletic performance; immune system support. 15-30 drops in water or juice, 2-3 times daily or as needed. Shake well before using.